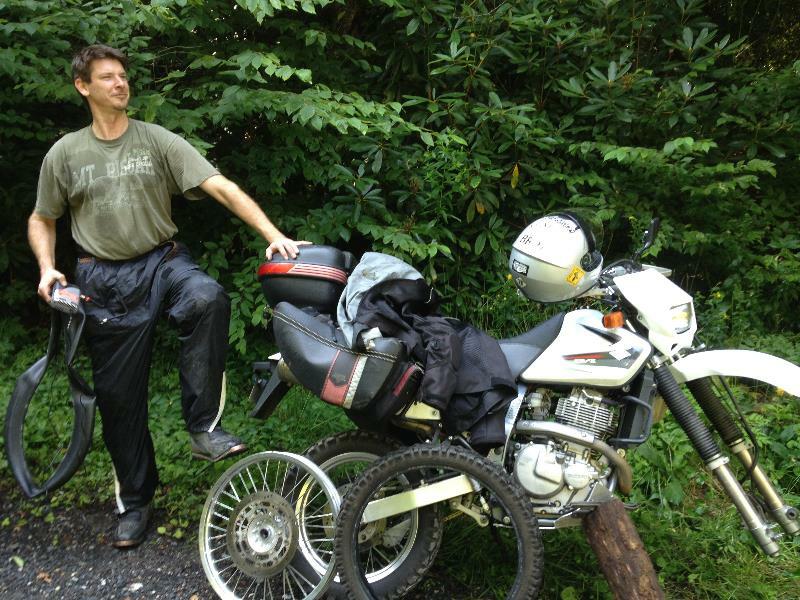 Me and my riding buddy Stretch have been talking about getting back up to Cherokee, NC to explore some trails. Stretch has ridden up there by himself and had a great ride, but there was a lot of stuff that he didn't want to ride solo. Another nice thing about Cherokee, NC is the roads are in pretty good shape. This was important since Stretch was riding with a few bruised ribs from the last dual sport ride he went on. We started off heading north and went through the Greenville water shed area. The roads are ok in this area, but the scenery is great. It was a nice curvy warm up for the rest of the day. Next we would be heading around Cedar Mountain on a mostly gravel road. 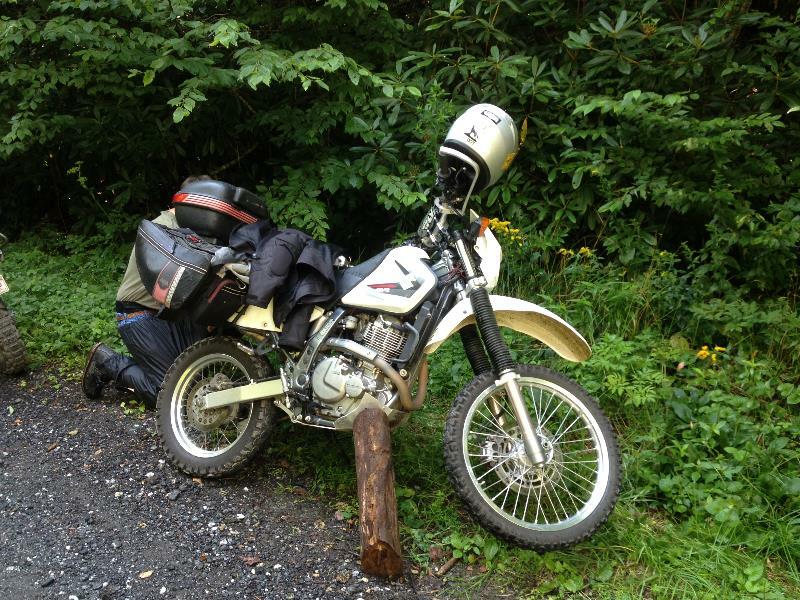 This road isn’t too difficult, just a good dual sport way to keep heading north. We have had an extraordinary amount of rain this year and it has washed out a section of hwy 178 so we took the detour on East Fork Rd. This road is a fun road to ride. Starting off from the 276 side there is a constant elevation change along with curves. It is great fun to just get in the groove and flow with your bike over the asphalt ribbon. There are also a few very tight hairpin curves that can sneak up on you. We continued making our way north and shortly after turning on to hwy 215 we took a left on another gravel road. The gravel was in great shape and you really could travel at a good clip safely. This road had a great photo opportunity and I missed it! There was a school bus parked in the woods so you could only see the front of it. All the windows were broken out and there were manikin heads hanging in the front window opening. The heads had a mix of beards and hair. It was actually pretty creepy and I wanted to get a picture, but I couldn't get Stretch’s attention. I plan to get back up there and grab a pic eventually. (UPDATE) Stretch got the pics of the bus! We continued on and the next event was a dog chase. Except this little dog was like the size of squirrel! He came out after Stretch and I started backing off to try and miss him, but that little guy ran right under me. I felt like crap about that. When we got turned around to check on him he was not in the road, so I’m not sure what became of him. A little further down the road Stretch nearly wiped out on a slight curve in the gravel. We pulled over and realized that his front tire was flat! We are both still new to dual sport riding and this would be the first trail side flat we have had to take care of. We pulled out our tools and went to work. It actually wasn't too bad to get it changed. We used a water bottle to rinse the tube and while Stretch was patching it I went through the tire and found the tiny little piece of metal that caused us to stop. After we got it all back together we felt pretty good about ourselves, but it definitely used up a good bit of time. Stretch has got a little captain in him. The weather had a chance of scattered thunder storms and as we made our way towards the Blue Ridge Parkway the temperatures went down, the elevation was going up, and the chance of rain was becoming imminent. Sure enough as we reached the highest point on the parkway we started catching a little rain. We stopped and put our rain gear on and pushed a little further, but the rain picked up. We turned around to try and stay out of the rain and we ended up with a vantage point where we could see rain all around us. I pulled up the weather radar on my phone and we waited about 20 minutes to let it pass. After the rain passed we continued on to Cherokee, NC to ride the BIA roads. All of these roads are gravel and there are plenty of jeep trails shooting off the main gravel roads. We had a nice water crossing shortly after hitting the gravel and that was just the beginning. As we wandered through the gravel roads and trails we found some great riding! The problem with wandering on random trails is you tend to get lost. While that is part of the fun, it can also get you home late or run you out of gas. Well, both of these things were happening to us. We finally found our way back to the town of Cherokee to get gas and some lunch. It was well into the afternoon, but it was still lunch for us. On our way back we were trying to find our return road. We did a lot of backtracking in Cherokee trying to find it. While backtracking we saw a lot of people fishing for trout in the rivers, we were chased by three dogs, and saw tons of people fishing along the banks of their campgrounds. When we found our way back to the Blue Ridge Parkway the sun was starting to get low and we were still very high up on the parkway. Looking out over the landscape you could see these frothy white clouds rising up from the valleys like a thick steam. It was a beautiful site to see! We did not stop for pictures because we were trying to get back out of the mountains before dark. As we blasted through the tunnels on the parkway our single cylinder thumpers sounded like helicopter rotors beating the wind. We only made it about half way home before it got dark on us and we found ourselves riding on a rough gravel road at night! While this is not the best decision ever, it was really fun! We had to slow down and be extra careful since you couldn't see very far, but it definitely made a great challenge. By the time I made it back to my door our ride was almost 14 hours and nearly 400 miles. It was long and we had a few challenges along the way, but that’s what an adventure is all about. One of my favorite things about these long rides is the opportunity to have some helmet time. That time is important to my sanity. The peaceful helmet time gives me a chance to reflect and shed the stress that causes unhappiness. Whether you ride or not find a way to get your own “helmet time”. Changing a tire on the trail wasn't too bad. Riding off road at night adds an extra twist to a challenging ride. Psalm 107:1 NIV "Give thanks to the Lord, for he is good; his love endures forever." I mentioned earlier about the importance of “Helmet Time”. When I started this ride I was stressed out and while I was excited to take a ride my mind was largely focused on the negative. By the time I was almost home my mind had been focused on other things and those negative feelings had melted away. When I pulled back into my driveway my frame of mind was transformed. I was now focused on how blessed I am. I have a beautiful wife that loves me and I have a healthy baby boy to enjoy. All my needs are met and we are blessed with great friends and family to share our lives with. God has truly been good to us. Helmet time is important for us all. Do you allow yourself to have a healthy amount of helmet time? How does it help you?